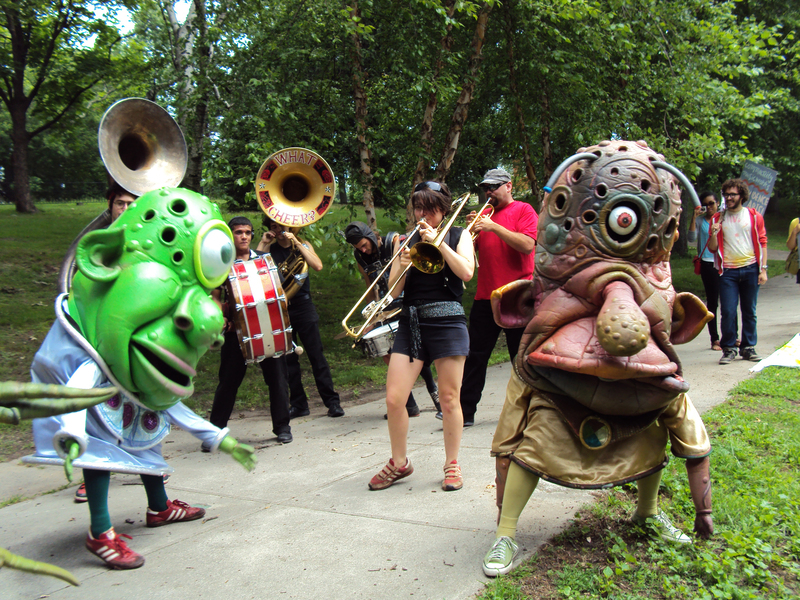 A quick report from the Urban Pond Procession. We started at Mashapaug Pond right behind Job Lot on Reservoir Ave and proceeded to the Temple to Music at Roger Williams Park. The water sprites put in a good word for us and the rain held off. Two brass bands, ‘Extraordinary Rendition’ and ‘What Cheer’ kept the beat, and Big Nazo was in charge of crowd control. ‘Extraordinary Rendition’ lived up to its name, performing completely new renditions of marching band favorites, managing to hit notes hitherto achieved only by the Portsmouth Sinfonia. ‘What Cheer’, taking a less anarchic approach, was smooth and satisfyingly recognizable. I loved them both, and whoever decided a parade should have brass bands was so right. You can’t ask grownups to walk on public streets wearing fish costumes without a little reinforcement. Big Nazo, as always, managed to be a little scary along with the funny. Local businesses helped sponsor the celebration, among them, Louie’s Family Restaurant, Sunny Market, Four Seasons Restaurant, and the Liberty Elm Diner. Also Wat Thormikaram, a Buddhist temple in the Armory District. One of the pleasures of the walk was seeing things I drive by all the time. The side streets with their modest houses, no two alike, the railroad tracks, the bridges. Roger Williams Park itself, a grand reminder of an age of great public works. We were a noisy spectacle. Little kids laughed and stared, and a woman in a caftan took pictures. She said, “You people are wonderful, South Elmwood thanks you.” Many Canada geese were unimpressed, but we had a good turnout and did it with style. 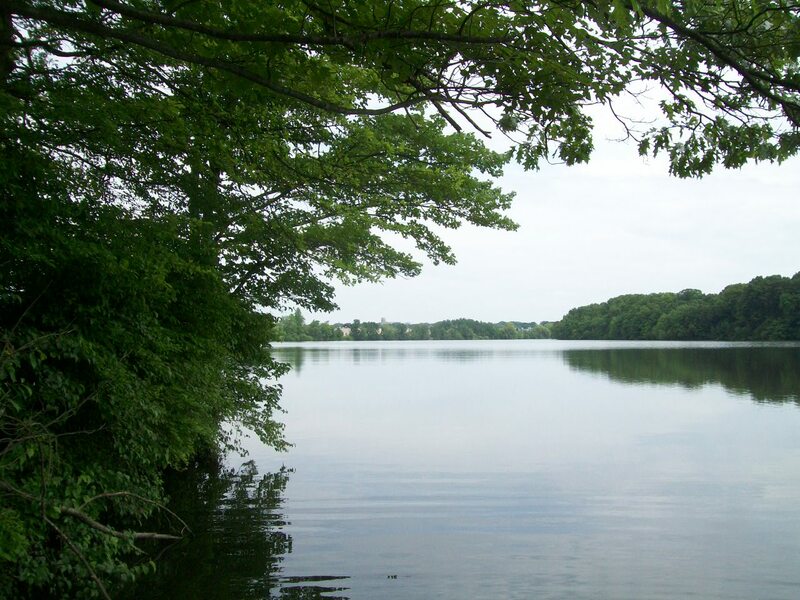 Follow this link to Mashapaug Pond and you will see warnings not to fish, swim, or even touch its water. The pond is badly polluted by street runoff and the waste from the Gorham Silver Company that stood on its shore for over 100 years. The pond is not natural, but man-made by damming streams that still run underground to Roger Williams Park. If Mashapaug has a resident goddess, she is a city girl, but that’s just right for our time and place. Birds nest and fish swim, and perhaps some day people will swim in the pond too. Looking at the progress made by Save the Bay I am optimistic. I’m also optimistic that this somewhat silly demonstration might bring a touch of Mardi Gras to our somber little state. The Urban Pond Procession has grown in three years and looks like it’s catching on. I remember the beginnings of Waterfire, another public event that invites us to look at the beauty to be found right here in the city. Now you can hardly even get to the water, it’s gotten so crowded, but it’s great. I’ll be looking out for next year, and other creative events this year at the Temple to Music in Roger Williams Park. Thanks so much for the write up on the procession. Sorry it took so long to leave a comment. We’re planning for next year with a focus on the Native American history around Mashapaug pond. Narragansett families will be working with me to create a picture book that shares how their ancestors would have lived near the pond during the winter months. Other artists in our group will also be researching the Narragansett culture and we’ll bring this understanding as well as environmental issues to our workshops with kids and families in the Spring. We’ll keep you posted about the unveiling of our Urban Pond Procession website!